I confess I am a late-comer to the work of Michael Morpurgo. Author of War Horse (read KBR's review of the illustrated edition here) and a former British Children's Laureate, he really is someone whose work I should have read a lot sooner! But he's now firmly on my list of favourite authors, a position only strengthened by the delightful Jo-Jo the Melon Donkey. First published in 1995, this is a new illustrated edition of this classic story. 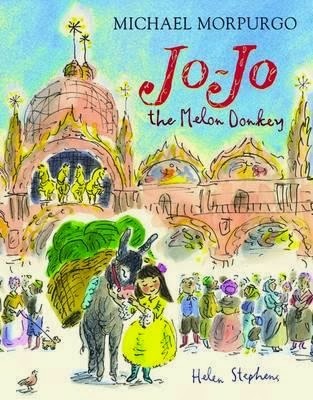 Every day, Jo-Jo the donkey carries his load of melons to the great city of Venice. Every day, all day, he is bullied by his owner and pestered by flies, and he longs with all his heart for something more … to BE something more than just a donkey. One day, while he's standing in St Mark's Square, beneath the statue of the four golden horses of Venice, Her Highness, the Doge's daughter, runs out of the palace to get a melon. She notices Jo-Jo's kind eyes and strokes his neck, the first kindness he's ever been shown. This happy pattern continues every day of summer, until one morning the Great Doge announces to the Venetians that he intends to buy the finest horse in the city for his daughter. Could this be Jo-Jo's chance to be more than just a donkey? In an endnote, Michael Morpurgo reveals that he was inspired to write the story after standing in St Mark's Square on his first visit to Venice, and gazing up at the four golden horses — the most beautiful sculptures he had ever seen. The fact that his wife adored donkeys was the extra bit of inspiration he needed to create the character of Jo-Jo. The result is a book that reads like a timeless fable, while bringing a little bit of Venetian history to life.